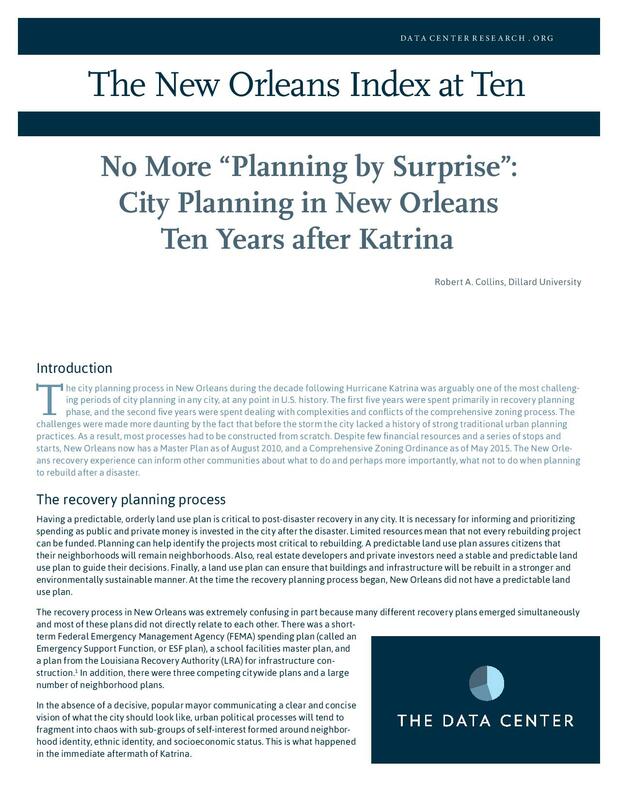 The city planning process in New Orleans during the decade following Hurricane Katrina was arguably one of the most challenging periods of city planning in any city, at any point in U.S. history. The first five years were spent primarily in recovery planning phase, and the second five years were spent dealing with complexities and conflicts of the comprehensive zoning process. The challenges were made more daunting by the fact that before the storm the city lacked a history of strong traditional urban planning practices. As a result, most processes had to be constructed from scratch. Despite few financial resources and a series of stops and starts, New Orleans now has a Master Plan as of August 2010, and a Comprehensive Zoning Ordinance as of May 2015. The New Orleans recovery experience can inform other communities about what to do and perhaps more importantly, what not to do when planning to rebuild after a disaster. The risk of flooding may increase in New Orleans unless levees are maintained or further upgraded. 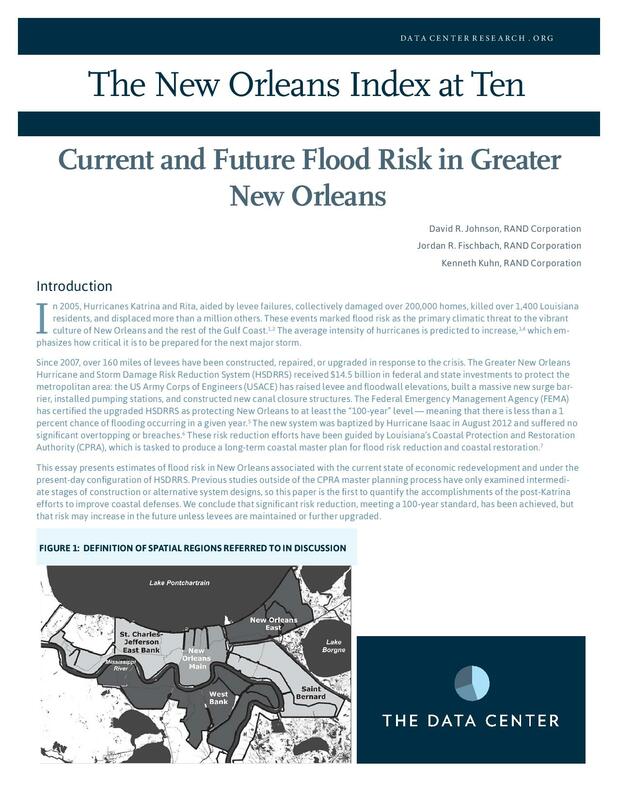 This report highlights the importance of an ongoing commitment to flood risk reduction investment in coastal Louisiana. This essay examines the extent of New Orleans public school reforms, as well as outcomes to date. It describes the challenges the decentralized system faced in equitably addressing school discipline, enrollment, and special education. 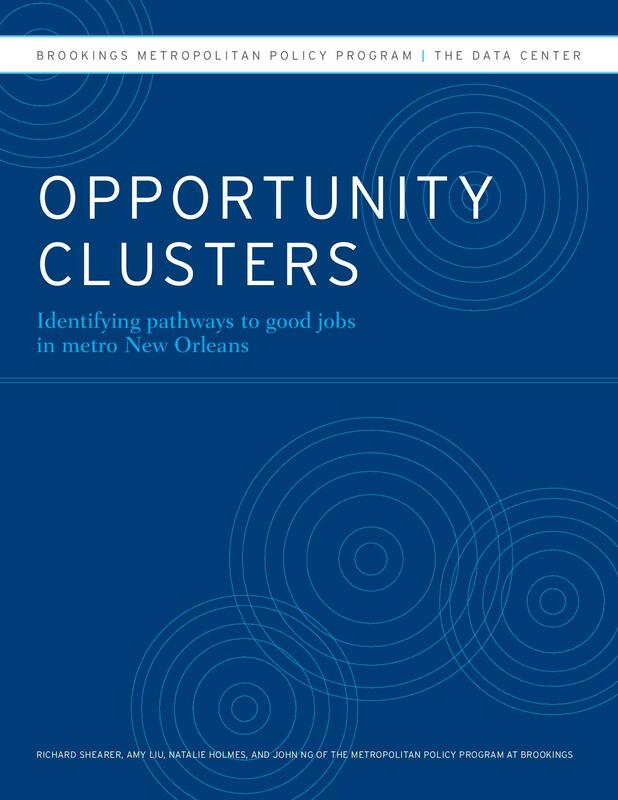 Metro New Orleans has experienced economic growth since the Great Recession, yet families in the region are still struggling to make ends meet. New Orleans needs more "good jobs". This report aims to inform policymakers on which parts of the local economy provide good jobs so that they can help shape an economy that works for people. Prior to Hurricane Katrina, the economic, political, and social context of metro New Orleans was not conducive to social entrepreneurship. This report identifies factors and agents that enabled a shift in the metro's entrepreneurial landscape. 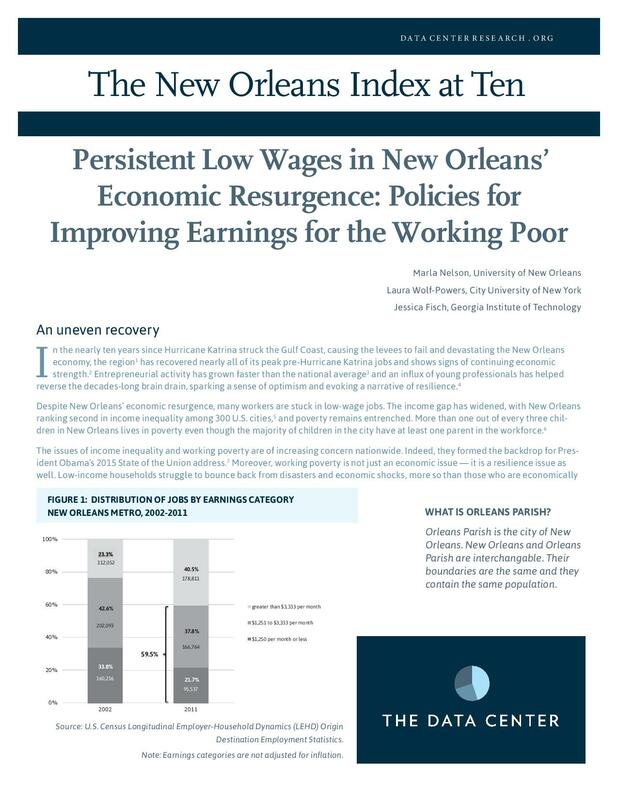 Ten years after Katrina, New Orleans has seen an economic resurgence, but too many jobs pay low wages. Many workers are traveling long distances to jobs for stagnant pay. In six out of seven parishes, out-commuting has increased since 2002, and many low-wage workers live in "wage deserts," areas with high concentrations of other low-wage workers. 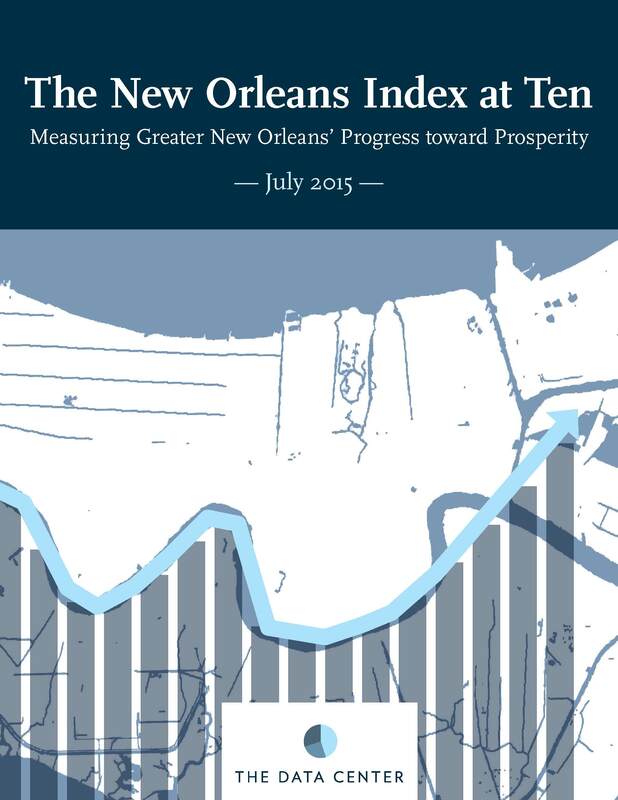 Explore over thirty indicators measuring greater New Orleans’ progress toward prosperity through economic growth, inclusion, quality of life, and sustainability. 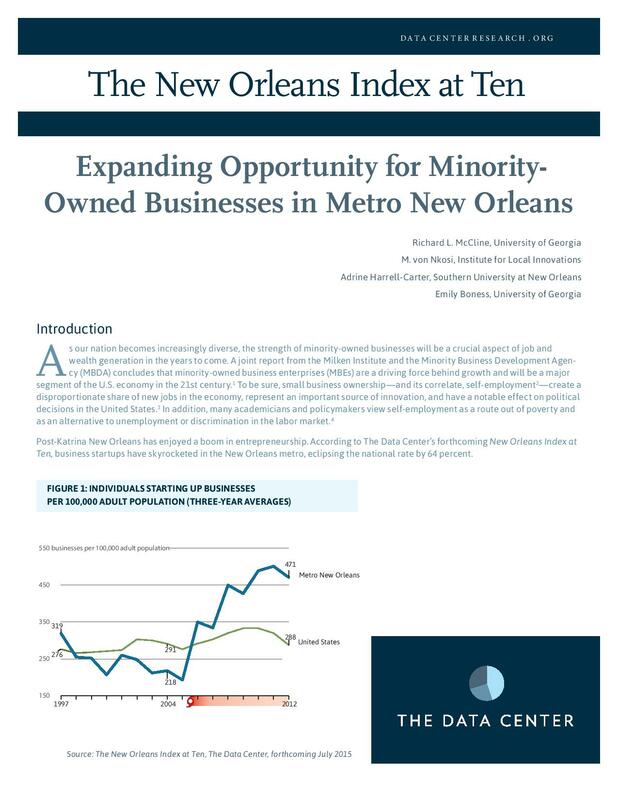 For metro New Orleans, where 47 percent (and rising) of residents are minorities, minority-owned business enterprises (MBEs) will play a significant role in driving job and wealth generation for the foreseeable future. Post-Katrina, New Orleans has enjoyed a boom in entrepreneurship, with startup rates eclipsing the national rate by 64 percent. However, the jury is out on whether the minority population of metro New Orleans has benefited equally from the recent startup renaissance. 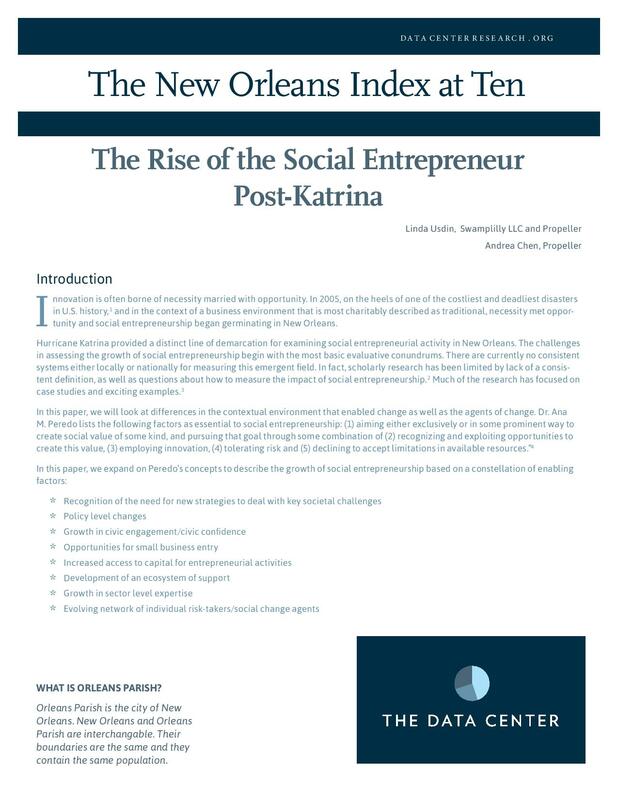 In this paper, we provide empirical data on how MBEs perceive the post-Katrina entrepreneurial ecosystem, including impressions on inclusiveness, supports, and access. We close with recommendations on policies and procedures that improve the ecosystem's ability to support MBE development. The significance of the housing voucher program in the New Orleans metro area post-Katrina cannot be overstated; the number of housing vouchers in use in Orleans Parish alone more than tripled from 2000 to 2010. Housing vouchers were a primary means of assisting households displaced by Katrina, especially following demolitions of public housing units that housed over 5,000 low-income households before the storm. 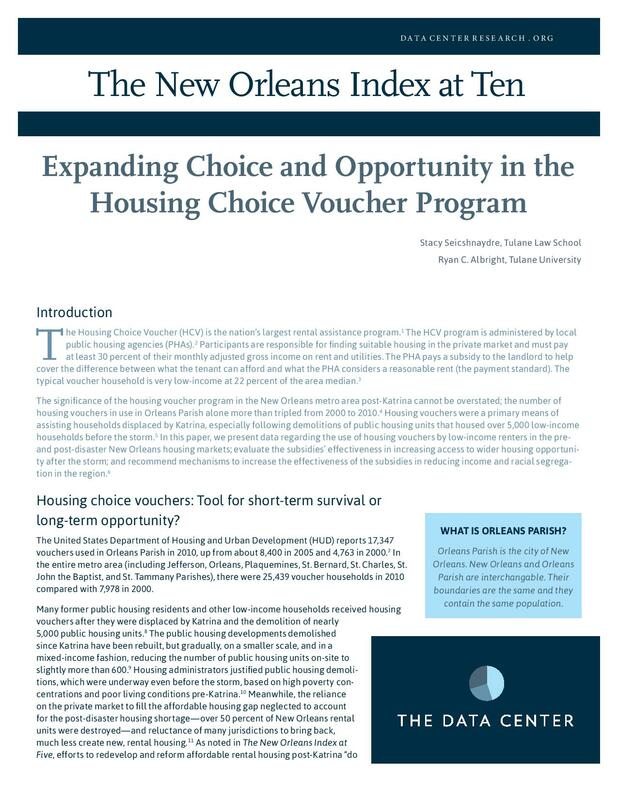 In this paper, we present data regarding the use of housing vouchers by low-income renters in the pre- and post-disaster New Orleans housing markets; evaluate the subsidies’ effectiveness in increasing access to wider housing opportunity after the storm; and recommend mechanisms to increase the effectiveness of the subsidies in reducing income and racial segregation in the region. 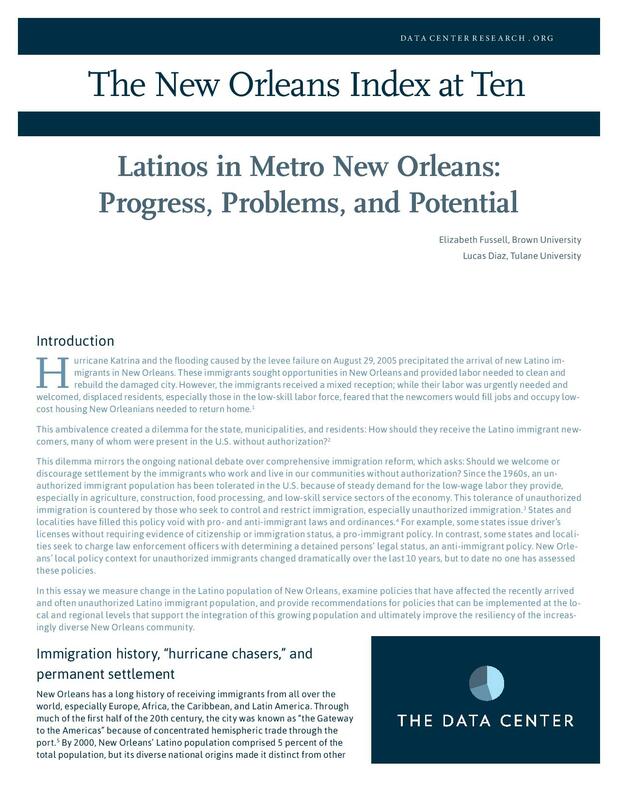 Hurricane Katrina and the flooding caused by the levee failure on August 29, 2005 precipitated the arrival of new Latino immigrants in New Orleans. These immigrants sought opportunities in New Orleans and provided labor needed to clean and rebuild the damaged city. However, the immigrants received a mixed reception; while their labor was urgently needed and welcomed, displaced residents, especially those in the low-skill labor force, feared that the newcomers would fill jobs and occupy low-cost housing New Orleanians needed to return home.